Home» Window » Best Useful KeyBoard Shortcut Keys for Windows user. Best Useful KeyBoard Shortcut Keys for Windows user. Hello Friends, you are welcome here. 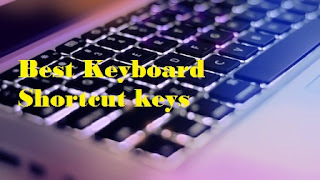 In this article, I will show you the "Best Useful KeyBoard Shortcut Key for Windows User". We will have a computer and always do some in less time. Generaly we don't have enough knowledge of shortcut keys, which work better when we have not much time to sit with our computer. What is KeyBoard shortcut according to Wikipedia? In computing, a keyboard shortcut is a series of one or several keys that invoke a software or operating system operation (in other words, cause an event) when triggered by the user. The meaning of term "keyboard shortcut" can vary depending on software manufacturer. For instance, Microsoft differentiates keyboard shortcuts from hotkeys ("mnemonics" on Windows) whereby the former consists of a specific key combination used to trigger an action, and the latter represents a designated letter in a menu command or toolbar button that when pressed together with the Alt key, activates such command—whereas a "hotkey" on Windows is a system wide shortcut that is always available in all contexts as long as the program responsible for it is running and not suspended. Now this is the end of post. If you like this post then don"t forget to share it. Thank u and Good bye.